Sometimes, the best way to stop a fire is to take preventative measures in your home before they happen. Install smoke detectors or alarms: these are surprisingly inexpensive, but be sure to check the batteries regularly. Have portable fire extinguishers installed near “danger” spots, familiarise yourself with their usage and write the expiry date on them. They don’t last forever, so replace them when necessary. Alternatively, have a regular appointment with a professional company to check up for you. Keep a fire blanket near danger spots. They deprive a fire of oxygen by smothering it. They’re made from fire-resistant materials, such as wool or fibreglass, and may also be chemically treated to increase fire resistance. It can be used to dampen fires and to extinguish a fire on a person or their clothing. Post emergency numbers in a prominent place or on every family member’s cellphone. Of all fires, this one needs swift action to prevent escalation. 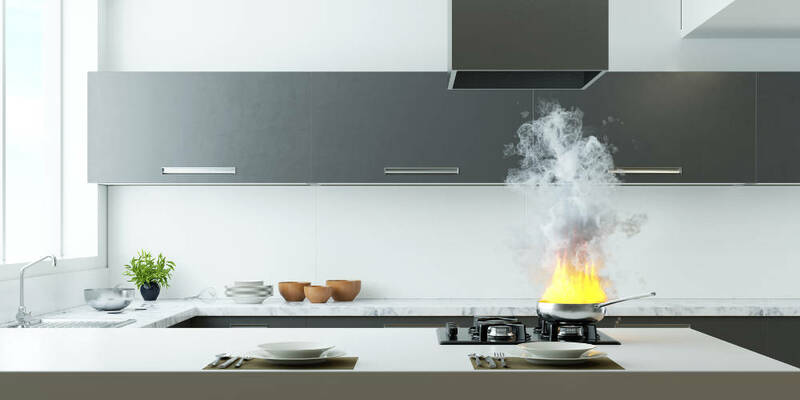 Here’s what to do when you have a fire in your kitchen. In the oven or microwave: close the door or keep it closed, and turn it off. Don’t open it. The lack of oxygen suffocates the flames. If your oven continues to smoke as if the fire is still active, call the fire department. In a cooking pan: use an oven mitt to clap on the lid to deprive it of oxygen, then move the pan off the burner, and turn off the stove. If you can’t safely put on the lid or don’t have one, use your fire extinguisher. Aim at the base of the fire or above the flames, not the flames themselves. You can also throw baking soda or salt on it. Not flour, which can explode or make the fire worse. Another option is to smother the fire with a wet towel or other large wet cloth. If you have a fire blanket, use it. All gas installations must have a certificate of conformity, which states that the installation has been inspected and deemed to be safe and leak free. The document needs to be issued by an authorised person registered with the Liquefied Petroleum Gas Safety Association of Southern Africa (LPGAS). The onus is on the homeowner to have this certificate. This applies to gas braai installations as much as a gas stove.